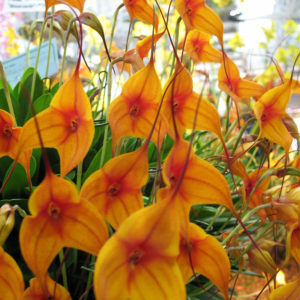 The genus Masdevallia comprises approximately 350-600+ species of New World orchids that are loved for their bright and showy flowers. Like other members of the Pleurothallid Alliance, Masdevallias lack pseudobulbs or thick roots, so they prefer conditions that minimize water loss: moderate to high humidity and moderate to low light. Although they are epiphytes, plants are usually grown potted in moss or a small bark mix to prevent drying out. Because of their love of humidity and tolerance for low to moderate light, these plants are excellent additions to terrariums.